Since 1975 Texacraft has been producing the highest quality furniture in the industry. Stunning selections aimed specifically at student housing, apartments, condominiums, hotels, and country clubs. Texacraft represents the finest in commercial outdoor furnishing. We provide customers with a broad product line and offer a one-stop source for many specifiers and designers. Click below to redeem your free expo pass! Manufacturers and suppliers are considered a separate registration classification (NONEX) and are not eligible for the free expo pass. Access to 800+ hospitality product and service providers. 35+ conference sessions featuring industry veterans, visionaries, and rising stars. 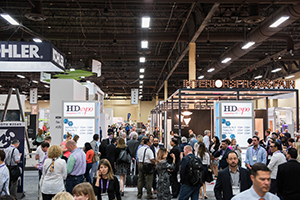 Longstanding industry relationships start at HD Expo's unparalled networking events.